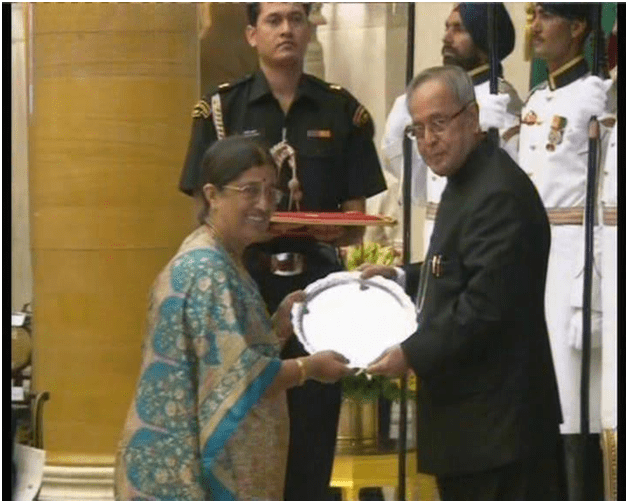 The President of India Pranab Mukherjee has conferred the Rajiv Gandhi Manav Seva Award on Kakamada Ganga Changappa for her outstanding contribution towards child welfare. The Award was presented to her recently in Delhi. After her marriage, Ganga Changappa, who holds a Master’s degree in English, settled down in Munnar where her husband worked for Tata Tea. Looking for something worthwhile to do, she found her vocation – welfare of women and children among the Tata Tea estate workers, teaching them skills which they could turn to profit. With the active support of Tata Tea, she became very involved in setting up a special school and rehabilitation centre in Munnar for children with disabilities – Dare School. She was its Principal for nine years and with her innovative ideas imparted specialised skills to her students in order to make them independent and earn a living. Her dedicated work was well recognised and in 1999 she received the FICCI award. When her husband retired as a director of Tata Tea, they settled in Kodagu. Even here, Ganga was determined to work for disabled youngsters. Tata Coffee, as part of their corporate social responsibility, set up a school on the lines of the Dare School, in Kodagu. The school, Swastha, a special school for the differently-abled was set up in Sunticoppa in 2003. It is partly residential and offers free education. She has worked tirelessly for eleven years taking the school to great heights. Tailoring, screen printing, offset printing, book binding, paper bags and candle-making are a few of the skills being taught there. Some of the youngsters from the school even got a chance to represent India at the international level in the Para-Olympics.